As part of their landmark visit to Nagorno-Karabakh held in conditions of a tense ceasefire His Holiness Karekin II, the Supreme Patriarch and Catholicos of all Armenians, and His Holiness Aram I, the Catholicos of the Great House of Cilicia, visited St. Hovhannes Mkrtich church of Gandzasar on April 13. According to the official page of the Mother See of Holy Echmiadzin, at the church the two spiritual leaders gave their Patriarchal blessings to Artsakh and soldiers of the Armenian army. 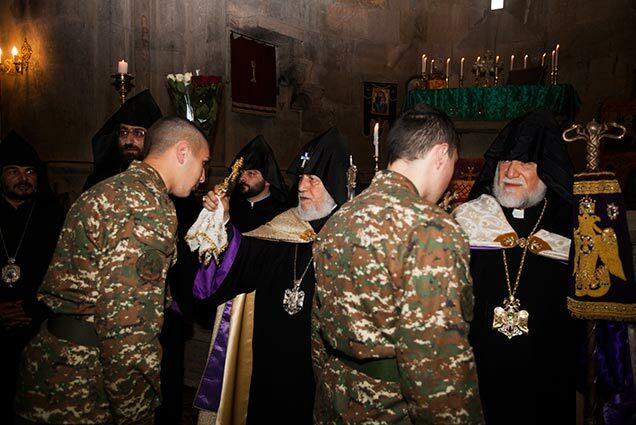 The two Armenian Catholicoi prayed for peace in Artsakh and the safety of Armenian soldiers. Addressing the believers, His Holiness Karekin II reportedly said that they have come to Artsakh to express their solidarity and to encourage the brave people and authorities of Artsakh. More than nine dozen servicemen of the Karabakh Defense Army and volunteers who joined regular troops to help them fend off Azerbaijan’s aggression have died defending the land since the start of hostilities on April 2. A verbal ceasefire reached on April 5 put an end to active military operations, but loss of life at the line of contact continues in sporadic skirmishes. Later on April 13, Karekin II and Aram I also visited the Central Military Hospital in Stepanakert where they offered their blessings and encouraging words to the wounded soldiers. The Catholicoi expressed their gratitude to the hospital personnel for their dedication and care and wished a speedy recovery to the brave soldiers. In the evening, the Catholicos of All Armenians and Catholicos Aram I toured Stepanakert’s Renaissance Square together with NKR President Bako Sahakyan. They were informed of the recent urban development activities, noting appreciation of the efforts of the NKR authorities towards the improvement of the city.